The recently released Occasions Mini Catalog doesn't disappoint! This whimsical set of 8, And Many Mower (113724) allows lots of creativity because you can color in the designs using Stampin' Write Markers (105541), Stampin' Pastels (105542), Watercolor Pencils (101879), Watercolor Wonder Crayons (106695). (See page 152 in the Spring-Summer 2009 Idea Book and Catalog). For those of you looking for the perfect "guy" cards, the sentiments and images will play along. The themes are golfing, lawnmowers and relaxing along with the sentiments for birthday and Father's Day. 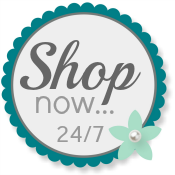 You can shop any time by visiting my Demonstrator Website and clicking on the "shop now" button! How cute! I love the ribbon you added. It's a perfect match! I agree with Tiffany, that ribbon is great and coordinates beautifully! great job on a masculine card! Those are always a little more challenging! great set, I am always looking for "manly" stamps for our birthday cards.